Does "La Lutte Continue"? The Global Afterlives of May ’68. Winthrop-King Institute International Conference. Florida State University. Tallahassee, FL. March 28-29, 2019. "The Role of Dramaturgs and Dramaturgy." American Dramaturgies for the 21st Century: Engaging with the New Millenium on Stage. Sorbonne University. Paris, France. March 14-16, 2018. Presenter, "Transforming Theatre and Emergency Medicine: Faultline Theatre Project's Holding Onto the Sky as Community Manifesto." American Society for Theatre Research (ASTR). Minneapolis, MN. November 3-6, 2016. Co-convener and Panelist, Play On! Labor and Controversy in the Oregon Shakespeare Festival Shakespeare Translation Project. Association for Theatre in Higher Education (ATHE). Chicago, IL. August 11-14, 2016. Presenter, "Judith Malina’s Art, Activism, and Anger." Mid-America Theatre Conference (MATC). Minneapolis, MN. March 17-20, 2016. American Society for Theatre Research (ASTR). Portland, OR. November 5-8, 2015. Association for Theatre in Higher Education (ATHE), Montreal, QC, Canada, August 1, 2015. 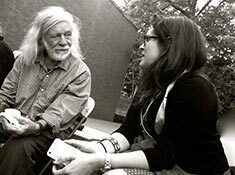 Kate Bredeson with Peter Schumann at Fifty Years Bread and Puppet: A Symposium at Boston College in 2013. Presenter, "From Nothingness to the Lush State of Being: Germinal’s Brave New World." American Society for Theatre Research (ASTR). Baltimore, MD. November 20-23, 2014. Presenter, "Beyond the Caravanserail: Nomads in and of the Théâtre du Soleil." International Federation for Theatre Research (IFTR) conference "Theatre and the Nomadic Subject: A Mobile Train Conference." Helsinki-Rovaniemi, Finland. April 7-11, 2014. Convener and Co-Chair. 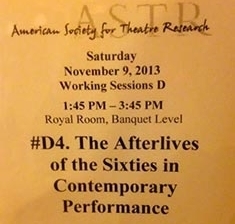 "The Afterlives of the Sixties in Contemporary Performance." American Society of Theatre Research (ASTR). Dallas, TX. November 7-10, 2013. Invited Keynote, "Bread and Puppet in France, 1968." Fifty Years Bread and Puppet: A Symposium. Boston College. Chestnut Hill, MA. September 14, 2013. Presenter, "Finding Utopia in the Theatre of May '68." Association of Theatre in Higher Education (ATHE). Orlando, FL. August 1-5, 2013. Presenter on the Norton Anthology of Drama Vols. I and 2, Association of Theatre in Higher Education (ATHE). Orlando, FL. August 1-5, 2013. Presenter, "Community and the Commune: André Benedetto's Avignon." Performance Studies International (PSi). Palo Alto, CA. June 26-30, 2013. Chair, "LEGACIES: The Now-Then of Political Performance." Co-Chair and Co-Convener, "Brecht and Benjamin at the Chess Board: Mapping Theatres of Exile." American Comparative Literature Association (ACLA). Toronto, ON. April 4-7, 2013. Presenter, "Americans Abroad: the Living Theatre in Avignon." Presenter, "Mass Spectacle and May '68." American Society for Theatre Research (ASTR). Nashville, TN. November 1-4, 2012. Chair and Commentator, "Narrating the Nation: Media and Performance at the Borders of Memory." Western Society for French Historical Studies (WSFH). Banff, Alberta. October 11-14, 2012. Co-Presenter with Peter Ksander, "We are All Playwrights: A Duet Discussion on the Devised in Practice." Devising Dramaturgy: A Shared Space Conference. Prague, Czech Republic. April 20-22, 2012. Presenter, "Staging America: Visions of the United States in French Popular Theatre of the 1960s." American Society for Theatre Research (ASTR). Montreal, Canada. November 17-20, 2011. Presenter, "Performing History: Staging France." Western Society for French Historical Studies (WSFH). Portland, OR. November 10-12, 2011. Presenter, "Playing with Loaded Dice: Power Onstage and Off for The Aquarium." American Society for Theatre Research (ASTR). Seattle, WA. November 18-21, 2010. Presenter, "Two Antigones, Two Faces of Modern France." Modern Studies Association (MSA). Victoria, BC, Canada. November 11-14, 2010. Presenter, "Performed History and Embodied Memory in 1960s France." Performances of Memory in the Arts. Radboud University, Nijmegen, the Netherlands. May 27-29, 2010. Invited Keynote, with Kristin Ross. "From the Odéon to Avignon: Theatre and Performance of May '68." With guest teaching and in-class-workshops for mini-course on May '68. Oberlin College. Oberlin, OH. October 27-30, 2008. Presenter, "L'Entrée libre à l'ex-théâtre de France"
May '68: Forty Years On/ Mai 68: University of London in Paris. Paris, France. May 17-19, 2008. Presenter, "Revolution as Theatre and the Revolutions of the Théâtre du Soleil and the Aquarium"
Association of Theatre in Higher Education (ATHE). New Orleans, LA. July 26-29, 2007. Presenter, "C'est l'apocalypse: André Benedetto's Napalm." 20th-Century Literature and Culture Conference. University of Louisville, Louisville, KY. February 22-24, 2007. Presenter, "Performance and Protest of May '68." Modern Language Association (MLA). Philadelphia, PA. December 27-30, 2006. Presenter, "L'Odéon est ouvert: the Occupation of France's National Theatre." 1968: Global Resistance/Local Knowledge Conference. Drew University, Madison, NJ. November 3-4, 2006. Presenter, "The End of the Absurd: The Swan Song Before May '68." Association of Theatre in Higher Education (ATHE). Chicago, IL. August 3-6, 2006. Presenter, "Under the Paving Stones: Philippe Adrien's La baye." 20th-Century Literature and Culture Conference. University of Louisville, Louisville, KY. February 23-25, 2006. Presenter, "In the Jungle of Cities: May '68 Arrives in Avignon." 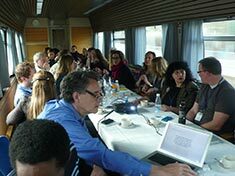 Photo of Finnish Train Conference by Laura Gröndahl, Photo of Kate Bredeson and Peter Schumann by Chris Woodworth. ASTR photo by Kate Bredeson.